From left: Jennifer Cody, Laurie Wells, Julia Brothers. 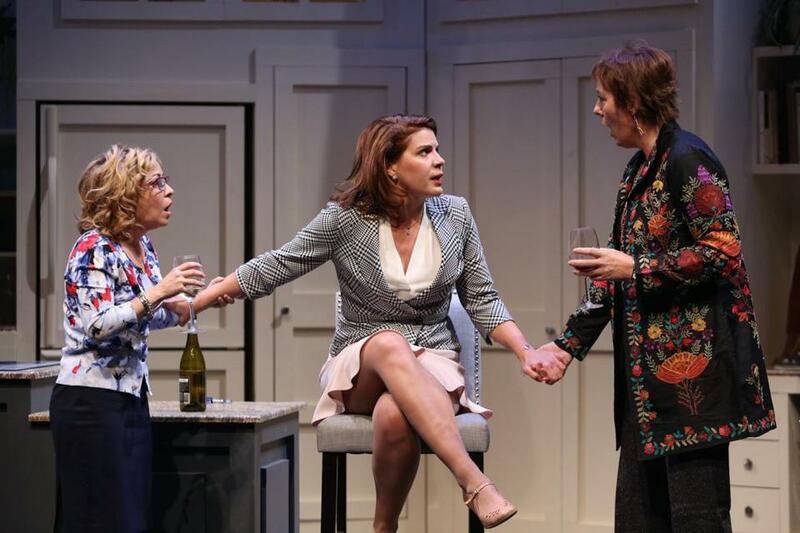 And the laughs in Wendy MacLeod’s play — which had a world premiere at Geva Theatre in Rochester, N.Y., last year — come fast and furious. It opens with longtime friends Jo (Julia Brothers, making a welcome Cape Playhouse debut) and Mary (Jennifer Cody, hilarious) dashing into the kitchen in Mary’s Utah home to refill goblets of wine and dish on the new boyfriend of their pal Liz (Laurie Wells, very good), who’s so smitten with dentist Jackson (Liam Craig, delightfully deadpan) that she can’t see the oddball her pals see. Still smarting from a bitter divorce, Liz charges jealousy. But cynical, wisecracking Jo, a publicist, and earnest Mary, a librarian, are actually pretty content (“We’re the divorced women doing fun runs and book clubs!”). But when Liz blithely announces that one of Jackson’s young hygienists disappeared from the parking lot the night before — after she borrowed his DVD of “The Silence of the Lambs,” no less — and Jackson has been questioned by the police, Mary and Jo go into full-throttle madcap rescue mode. Seems Liz wants her 19-year-old daughter, Amanda (a funny Ashley Shamoon), to bond with Jackson, so they’re headed to the woods for a weekend camping trip. The notion of a possible murderer alone with the trusting Amanda sends Jo and Mary to the cops, where they present their “evidence” to a detective (also played by Craig; the double casting makes for a running gag). Mary also enlists the help of Amanda’s ex-boyfriend, sweetly dopey snowboarder Trenner (Scott Rad Brown), who mistakes Mary for a cougar and later channels his inner John Cusack in a great “Say Anything” moment. It’s all good, silly fun, directed with precise comic timing by the seasoned Sean Daniels. Cody, last seen as Gwendolyn Pigeon in the Cape Playhouse’s 2014 production of “The Odd Couple,” is a pint-size dynamo with a speaking voice reminiscent of Bernadette Peters. Onstage for nearly all the action, she’s a gifted physical comic who can draw laughs from her double takes alone. The paranoia and finger-pointing escalate to a confrontation in Mary’s kitchen and later at the camp site, where all the actors execute the surprises, sight gags, and revelations with such strong comedic chops that even moderately funny lines sound side-splitting. Daniels and the cast keep up the pace, even though the play could benefit from a trim of 15 minutes or so. Michael Raiford’s sets and Erik Fox’s lighting design serve the material well; the actors turn even the scene changes into bits as they humorously gyrate their way through blackouts. So much history permeates the Cape Playhouse, now in its 89th season, from the stage to the wooden rafters. But it isn’t just a museum. With “Women in Jeopardy!,” this venerable theater offers a new work that’s modern, lively, and loads of fun. Set, Michael B. Raiford. Costumes, Amanda Doherty. Lights, Erik Fox. Sound, David Remedios.